Offices are, by nature, going to have some noise: they involve a lot of people working in a fairly small area, chatting, making their lunch, talking on the phone, walking from place to place, typing at their computer, coughing, and so on. But add to that other sounds: computers whirring, chairs squeaking, doors slamming, elevators dinging, microwaves beeping, phones ringing, cellphones going off…and you start to have what some have called an acoustically hostile environment: a place where it’s hard to concentrate. Office noise can cost you productivity and make your workers miserable. Fortunately, it’s also an easy problem to fight. With some simple steps, and some smart choices, you can make any office an oasis of quiet. Ask that employees set their cell phones to vibrate, avoid using speakerphone on personal calls, and limit personal calls to five minutes or less. Of course, they should be doing this anyway, but understanding it’s about their fellow workers makes them more likely to comply. Set a rule by which conversations that might run long be taken out of the cube and into someone’s office or a similar space. If employees listen to music over their computers, ask them to use headphones, and to keep it down to a low level for other people’s sake. A good demonstration is to, for example, put on some headphones and play a song at high volume: that way people can really hear just how loud supposedly “personal” headphones really are. Talk privately with employees others complain about. Unsurprisingly, people who make lots of noise are comfortable with others being noisy, and may not realize that they’re distracting their fellow employees. Just have a brief chat with them about noise, so they understand where you’re coming from. 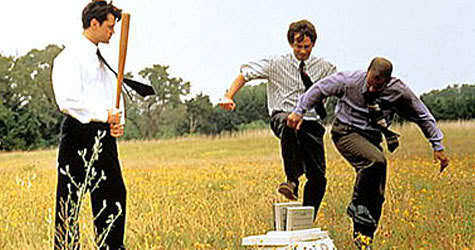 After coworkers, the next step is looking at the equipment in your office, and the office itself. Start with the way the office is built: are there tile floors, hard paneling, or other hard surfaces? It’s important because sound reflects, and even sound energy you can barely hear can be distracting to your employees. If you want a demonstration, just grab something that makes a sharp noise, like a stapler, and click it over a carpeted area…and then over a tiled area. You’ll notice the difference as the sound reflects. Similarly, look for placement of building systems like air-conditioning ducts and elevators. These can not only make noise, but also carry noise from other parts of the building. Developing — and sticking to — maintenance schedules for all of your office equipment, especially your office furniture. Nobody likes a screaming, chattering fax machine, but even something as simple as a squeaking chair can drive everyone absolutely crazy, and often offices will let bad furniture slide as long as possible. Don’t let loud chairs or stuck desk drawers drive your workers crazy; have them repaired and properly maintained. Making sure building systems, like air ducts, are properly soundproofed and insulated. If possible, ask that the ceiling tiles be replaced with something more sound absorbent. Moving noisy equipment away from hard surfaces, if at all possible: those reflect an enormous amount of sound. If they can’t be moved, lay down some carpeting on the floor to help absorb sound and reduce reflections. Moving loud equipment — like copiers, fax machines, and large printers — out of common areas. Give them their own room, if at all possible. Consider soundproofing this room, as well. If that’s not possible, try partitioning them off with sound-absorbing cubicle walls. Checking the manuals for noisier equipment in the hunt for volume control and other maintenance advice. For example, fax machines usually have some form of volume control that make their trademark piercing squeal just a little more tolerable. Looking into quieter replacementsfor your office furniture and equipment. Remember: it isn’t as costly as you may think. More recent used furniture will be in better repair, and newer office equipment will be more energy-efficient and less wasteful. Remember, happier workers are more productive workers, so you’ll be seeing more value from your labor as well. Beyond moving equipment and repairing furniture, there’s also larger things you can do, ranging from technological solutions to total redesigns of your work space. For example, for a long time, the “open” office plan, with no cubicle walls, was extremely popular; it was considered to foster communication, and offer a more informal environment. Unfortunately, it also can also foster a noisy environment. So consider, for example, creating “conversation spaces” using cubicle partitions that allow employees to step away from their desks and have short conversations, which will also be good for cell phone usage. 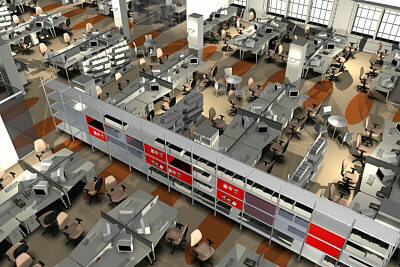 Or create an open space for people to work, and put in cubicles for their desks. Another effective tactic is a “pink noise” system. Essentially, it’s a device attached to speakers that generate what sounds like a low whooshing sound, but it’s really a collection of frequencies at around that of the human voice. This has the effect of, for example, making conversations impossible to hear from more than 20 feet away, thus making the office quieter overall. Whichever option you choose, remember that you’re doing this to make your work space a happier place to be. Cutting down on noise will make your employees better able to focus, which means more gets done and everybody wins.